Nazareth College is proud to announce that Daniel Howard of Dansville, NY, has been named to the dean’s list for the Fall 2018 semester. 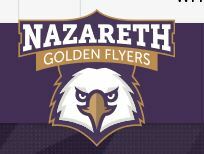 Nazareth College’s academic strengths cross an unusually broad spectrum of 60 majors, including education, health and human services, management, the fine arts, music, theater, math and science, foreign languages, and the liberal arts. The coeducational, religiously independent, classic campus in a charming suburb of Rochester, N.Y. challenges and supports 2,200 undergrads and 700 graduate students. Nazareth is recognized nationally for its Fulbright global student scholars and commitment to civic engagement. Rigorous programs, an uncommon core, experiential learning, career skills, and a global focus prepare graduates for not just one job, but for their life’s work. Nazareth College’s academic strengths cross an unusually broad spectrum of 60 majors, including education, health and human services, management, the fine arts, music, theater, math and science, foreign languages, and the liberal arts. The coeducational, religiously independent, classic campus in a charming suburb of Rochester, N.Y. challenges and supports 2,000 undergrads and 800 graduate students. Nazareth is recognized nationally for its Fulbright global student scholars and commitment to civic engagement. Rigorous programs, an uncommon core, experiential learning, career skills, and a global focus prepare graduates for not just one job, but for their life’s work.